For your information and records, I have recently purchased ' MONIKA ' from Ron Kulbach, Friday Harbour. I sailed her through the San Juan and Gulf Islands to our house on the water in Qualicum Beach, BC. 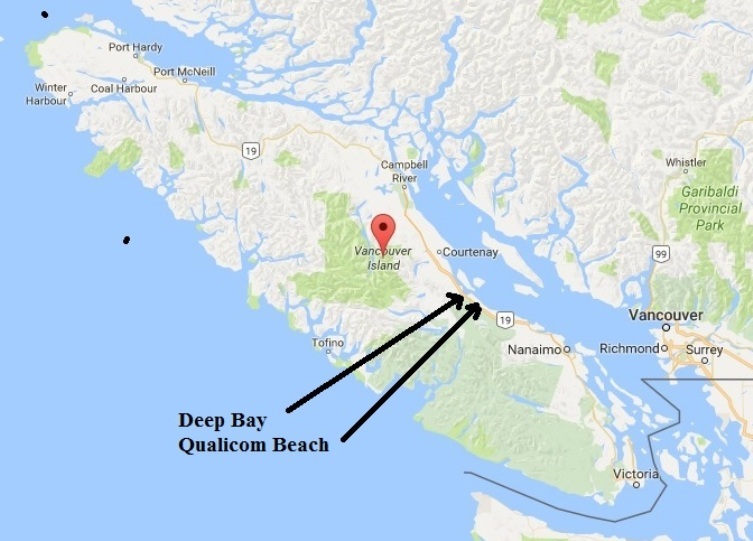 Qualicum Beach is on Vancouver Island, about 100 miles north of BC's capital city Victoria. MONIKA is lying to her mooring in a very open anchorage in front of our house. I have found MONIKA a fine pocket cruiser, very responsive to the helm. Ron, the previous owner, has a built a sturdy vessel with many well thought through customized features. Hopefully I will enjoy cruising this exceptional vessel for many years in our beautiful waters. January 30, 2017. Its been a while so we thought we'd try and find out what MONIKA's been up to. Sorry not getting back to you earlier. I am presently on an extended trip to Australia. Plan is to sail Monika solo around Vancouver Island this summer, about 1000 N.M. Will get back you later this year. Back home on Vancouver Island but my baby MONIKA I have not seen yet. During the colder months we live in Victoria, capital of British Columbia. 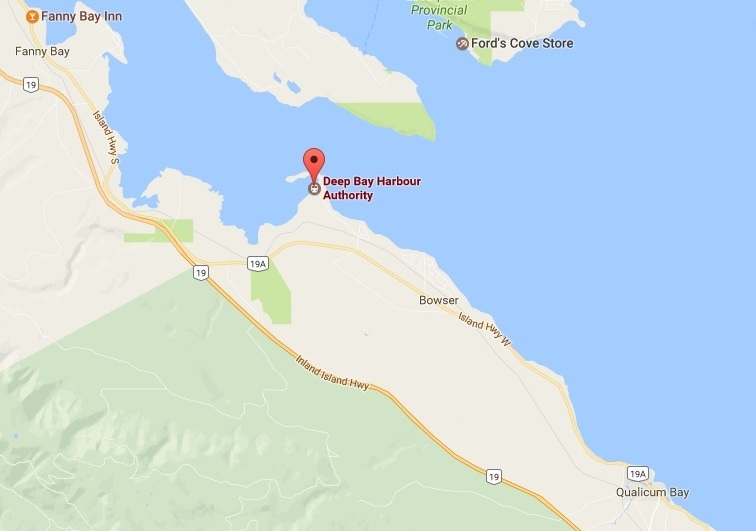 Monika is about 120 miles north of here in the DEEP BAY MARINA, on Vancouver Island. I will drive up in 2 days. The first summer I had her on a mooring buoy in front of our house in Qualicum Beach ( Deep Bay is another 15 miles further north ). While she was a nice sight, the anchorage is just too exposed. Much appreciated the reading assignment. A fun read. ( http://dolphin24.org/a_many_windowed_sea.html) However, indeed better to sail around the island counter clock wise. Gentlemen don't sail against the wind if avoidable. Further best start for a Vancouver Island circumnavigation is middle to end of June. As Chris, the author found out, August is our FOG month. Other option - middle of September. I will follow up with photos later and writings. Nothing new to report at this time. The information you have on MONIKA is up to date. During the 12 days I was the only one sunning on the trampoline, sitting on the chairs at the bow . All others were always inside, communicating with I pads, I phones and the like. I am so bloody old fashioned and do not even have a cell phone (yet). There was no smell of tar or wood, no creaking or groaning of timber, no tiller giving delightful, instant responses to a seat of the pants sailor.........plastic, plastic and more plastic. I never even donned foul weather gear. A floating cottage, a Winnebago on the water. Ron, I am of a similar vintage, 76 this August.......enjoying fine health. Presently I will enjoy sailing Monika on the fine waters between Vancouver Island and the mainland of British Columbia. Not sure if I mentioned before that, in Monika, Rod Kulbach had built a very strong, sturdy vessel, which is far superior to standard production vessels. Rod was happy when I kept the name - Monika was named after his mother. Keep up the good work. All the best. This is Monika's story before Klaus got her. May 6, 2014. Monika is FOR SALE. This is the link to the CraigsList ad http://seattle.craigslist.org/see/boa/4454237256.html. Here is the ad. June 14, 2011. Dale Wheatly, Tiare, Pacific Dolphin #267 passed on the following remarkable story (minor edits). The Dolphin Field Investigators (DFI's) and our internal staff are at work following up. Stay tuned. I had an interesting Dolphin 24 encounter this spring. A gentleman approached me while on Tiare and ask if he and a friend might take a look at the boat as he owns a Dolphin 24 too. He had pulled her out of the water for maintenance at IMC. His Dolphin (Monika) is quite unique in that it has the typical hull with shoal draft keel, but, a completely different cabin structure with the deckhouse running the full beam of the boat (no side decks) and standing headroom. The story gets even more interesting as the the owner told me he obtained the Dolphin 24 hull molds and built his boat himself in the 1980s. The different cabin design was adopted to make the boat more useful as a cruiser. The owner keeps Monika in Friday Harbor on San Juan Island, WA. I say the owner is possibly Rod Kulbach because when we talked I think he just mentioned his name was Rod or Ron, but, I can't remember for certain. I have a book at home named "Baja Dreaming" (book cover at left) by a Friday Harbor author named Rod Kulbach. The author's bio says he sails aboard Monika, a 24' Sparkman and Stephens sloop he built and launched in 1989! There is a book review of Baja Dreaming in the June issue of Cruising World. Click here to go to the Stories Section and more on Baha Dreaming. June 15, 2011. An Internet search and a couple of phone messages led to Rod Kulbach checking in by phone last light. We have confirmation. Monika is the 301st Dolphin (her design changes are noted) Mike Zint's Grand Finale still gets a nod as the last production built Dolphin. Monika is the 182nd Dolphin that we have found. We await more details but these are the essentials. In the early 1980's Rod obtained the hull mold for the Dolphin 24 from Romaine Corbin who ran Pacific Dolphin. He laid up the hull making several changes including closing in the centerboard slot with additional ballast, and adding a lead shoe which was bolted on to the keel making a heavier, stiffer boat. The deckhouse is full width and there is standing headroom. In due course we hope to fill in details and get pictures. Just an update, I met Rod Kulbach in the San Juan Islands about 2 years ago. We anchored Esther (formerly Poisson, Yankee Dolphin #89) in Blind Bay of Shaw Island when a small sailboat came by, circled around, and then complemented my Dolphin. Doing a double-take, I recognized the hull shape, but not the cabin. Then I noticed the Dolphin logo on the bow. "Nice Dolphin" I complemented. We rafted up and got to check out his boat. Alas, I can't find the pictures right now, but I'll look into my archives. The boat had a cabin tall enough to stand up in, with round bronze portlights (facing forward in the pilot house). The cabin was full beam width. It had a somewhat similar cabin layout to what I think are the early Dolphins. Rod and his wife were very nice folks and we had a nice talk for a couple of hours before they headed out for more adventure. I'm hopeless when it comes to computer stuff. What seems so easy for most of us is a real struggle for me: facebook, blogs, taking and sending images, posting, etc., it's worse than Greek to me. So, I'll try to get something to you as soon as I can get a little help. Yes, there is a "Monika" story, though I would guess there's a story in just about every Dolphin ever built. A couple of things to address now. Yes, there is a raised deck, as in a Cal 25, some of the other Cal boats, and Tanzers. On "Monika" I dropped the foredeck back down so she looked conventional when viewed beam on; in the Cal 25 the raised deck continues right to the bow. I didn't raise the heights of the cabin; I brought it out so there is no side deck. Then it gets more interesting. Barbara and I wanted some standing headroom below, and I wanted to steer from below via a couple of tiller lines passing through bushings in the bulkhead. So I built a new sliding main hatch that, with a couple of opening ports (I used Beckson deckplates) had the overall effect of a machine gun turret. But it gave us headroom under the hatch; you just had to pay attention or you would slam your head as you slid the hatch forward. This went on for a few years, until finally Barbara convinced me to do the whole thing: chop a hole and build a small pilothouse. That's where we are now, and it's been wonderful. I hope Rod S. won't be offended. What with the rain and drizzle we have here, and the long winters (Summer never really got here this year) it's wonderful to stand below, tiller lines in hand, looking through the long Lexan windows and the two opening forward facing ports (no, no bronze ports, just Beckson deck plates as before) and the whole thing has been a success. Yes, I'll try to send you something you can look at. In the meantime, the version of Firefox I'm using often doesn't allow me to send mail, only to receive it. Who knows? Thanks for staying in touch. August 19, 2011. Your webmaster had a few questions, and Rod has provided a couple of more chapters of Monika's Story (minor edits). I'll try to address the other questions, but you asked me point out any inaccuracies re Monika. The hull is solid glass, the original cabin top was done over a male mold. For insulation, I wanted to use Klegecell (with strips of balsa for the toerails) and the male mold approach seemed worth the effort. I wanted to have a gelcoat surface for the exterior and interior cabin top, and so there was a lot of sanding, inside and out, and then fairing and sanding and polishing and rolled on non-skid that seemed to go on and on. But now, about 22 years later, I haven't had anything to do with that part of the boat, other than an occasional (once a year or so) waxing; mostly to (I think) keep the pores closed and the dirt out. Yes, the foredeck and cockpit are marine ply and epoxy. I wish I had also used a foam core for the cockpit well; seems that's where all the stuff gets dropped: winch handles, tools, metal cans, on and on. So far no problems, but I have noticed some dings but no delamination. I didn't keep accurate track of time, and I wasn't building full time, but it took over a year from re-conditioning the mold to launching. The rig is the same. I use an 8 hp Tohatsu (Nissan if you'd like) and there's plenty of power, enough to throw a wake when I crank it up. No, Monika has not been to Baja, mostly because I'm too chicken to sail that first stretch from Nea Bay to San Francisco. Yes, I know I can trailer her or have her shipped - again - and that's still an option, though I really do like it here. In case I haven't told you, but I think I may have, Monika was my mother's name, and when she died she left me some money; what better way to use it? Baja Dreaming is doing well; thanks for the link. I can row her, steady, standing and pushing fisherman style, at about 1 knot. You can see the oars standing upright snuggled against the uppers. Rod and I are working on getting more of Monika's story.